Mark began his public accounting career with KPMG and left as a senior auditor before embarking on a career in Corporate America. Mark is a California CPA and brings the broad perspective and maturity of more than 30 years of solid business experience to his practice, having served as both a proven financial executive, consultant and CPA serving small to medium sized businesses. Mark’s experience ranges from consulting, to financial executive positions, including Chief Financial Officer, Vice President of Finance and Corporate Controller. Mark has also provided senior level management and leadership support in the accounting and finance functions for numerous public and private companies, producing successful results along the way. With this experience, Mark brings a proven track record, financial knowledge, and maturity to the table. Mark enjoys golf, sailing, motorcycling, traveling and spending time with his family and friends. Mark is an active member of the California Society of CPAs and serves as Treasurer for a non-profit organization. 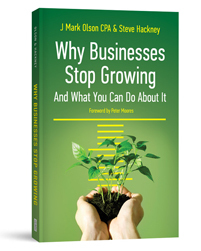 He is also the co-author of the book Why Businesses Stop Growing. Our Consultants come from a talented network of senior executives, all of whom have held financial positions such as CFO, VP Finance, Controller and Treasurer. They resolve problems and help to create solutions for companies of all different sizes, including Fortune 500 companies, smaller start-ups and established companies. For more information, please click here and we will contact you as soon as possible. Or call us at (949) 291-9211.